This small compact Portrait-Style gas fireplace is designed for intimate spaces such as bedrooms, baths and kitchens. 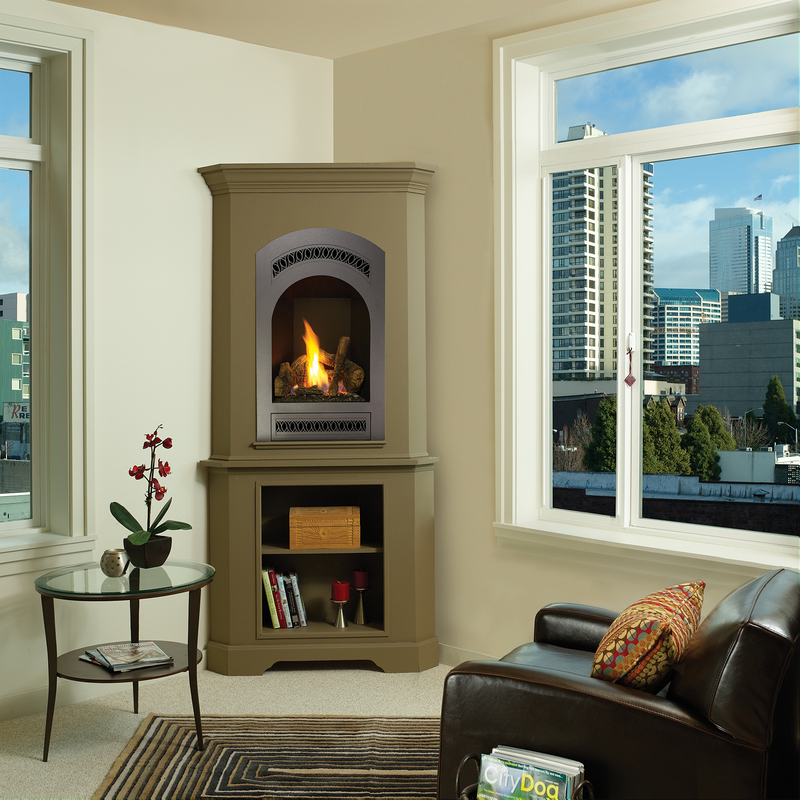 The 21 TRV GS Bed & Breakfast fireplace features the award winning Ember-Fyre™ burner. With 16,500 BTU’s maximum input this fireplace heats up to 650 square feet. The fireplace features 303 sq. in. of fire-viewing, 16″ w x 20 1/2″ h.
The Bed & Breakfast fireplace gives you a cozy and convenient way to provide the warmth and beauty of fire to small, intimate settings such as bedrooms, bathrooms, dining rooms or kitchens. The realistic flame along with the heat output, can be easily adjusted with our Comfort Control ™ gas valve. This allows you to turn the gas input down 77% while maintaining the fire and glazing embers, giving the fireplace the ability to be utilized and enjoyed year round. The 21 TRV GS can be personalized to your home décor. Choose from a range of face options in a variety of designs and finishes. The 21 TRV comes with standard black interior and can be upgraded with one of the beautiful interior liner options. Finally complete your installation by adding a quiet convection blower that is ideal for circulating the fireplace warmth quickly and evenly throughout the room and the GreenSmart™ remote control. Practical, efficient and beautiful – The 21 TRV GS gas fireplace gives you the ability to add the beauty of fire virtually any room in your home!